Shirley Chisholm: "Unbought and Unbossed"
Shirley Anita St. Hill was daughter of Caribbean immigrants, her father, Charles St. Hill, born in British Guiana, her mother, Ruby Seale, in Barbados. The couple immigrated to the United States in 1923, their daughter born in Brooklyn the next year. Her parents sent Shirley Anita St. Hill to Barbados when she was three so that she could receive the best possible education--as she noted, "Years later I would know what an important gift my parents had given me by seeing to it that I had my early education in the strict, traditional, British-style schools of Barbados. If I speak and write easily now, that early education is the main reason." She returned to the United States in May 1934, to Bedford-Stuyvesant, where her parents had settled and where she would attend the prestigious Girls' High School. After graduating from Brooklyn College in 1946, she began her professional life as a nursery school teacher while she was enrolled in the M.A. program at Columbia. In 1949, she married Conrad Chisholm, earned her Columbia M.A. in 1952, and worked for New York City's Division of Day Care until 1964, when her life changed. 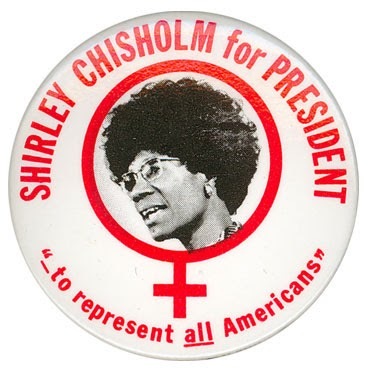 In 1964, Chisholm ran for state office and went to Albany, where she became the second African-American woman to become a state member of the New York state legislature. After a court-ordered redistricting, Chisolm ran for a seat in the U.S. House of Representative in 1968--her campaign slogan was "unbought and unbossed." Only two African Americans were elected to Ninety-First Congress (1969-1971), bringing the total of African Americans in the House to nine. 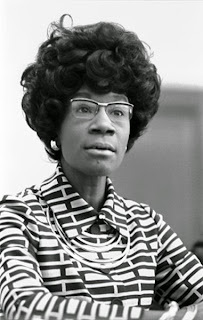 Shirley Chisholm was the first African-American woman elected to the U.S. House--where she would serve for seven terms. Chisholm had a long and influential role in the House, where she served until 1983, and I will link you here to here to the U.S. House of Representatives History, Art & Archives page for her official biography, details of her committee assignments, and a detailed bibliography. And then, as noted above, there was 1972: Bella Abzug, Shirley Chisolm, and Patsy Mink, all running as Democrats. In that same year, Linda Jenness was the nominee for the Socialist Workers Party. Chisolm died on 1 January 2005. There are a number of biographies, but why not read her autobiography, recently published in a fortieth-anniversary edition: its title is taken from her original campaign slogan, Unbought and Unbossed.